I dedicate this article to my grandmother, Heriberta Rubio Sosa, who is celebrating her 86th birthday and continues to inspire me each day. In her younger years she marched alongside her fellow farmworkers in Salinas, California during the Huelgas of the 1960s. Her work as an advocate showed me that courage, determination and strength is in my blood. Although our history books may only refer to Susan B. Anthony, Alice Paul, and Elizabeth Cady Stanton as leaders of the national Women's Rights Movements; they often leave out the stories of unsung heroes who fought for those same rights at the grassroots level. Alice Dickerson Montemayor, one of LULAC’s early pioneers, is one of those forgotten stories. Throughout her extraordinary life, she relied on grassroots efforts within LULAC to advocate on behalf of women. Montemayor began advocating for women's rights on the local level, and through her perseverance and diligence became a voice for Latina women nationwide using LULAC as her platform. Montemayor’s work was not only ahead of her time, but continues to be relevant today. Her ideals, philosophy, and actions have withstood the test of time, and are easily applicable to today’s issues of representation and equality. Alice Dickerson Montemayor was a member of LULAC’s first Women's Council, Laredo Ladies LULAC. As a wife, mother, worker, and businesswoman, she challenged the status quo of LULAC in the 1930s and advocated for women’s rights and full equality, issues she considered to be basic civil rights. When LULAC was founded in 1929, it did not extend membership to women. When membership was eventually opened to women in 1933, they were relegated to gendered-segregated councils named Ladies LULAC. Between 1937-1940, Montemayor was the first woman to hold three national positions: second General Vice President, Associate Editor of the LULAC News, and Director General of Junior LULAC. She used each position to advocate for women and youth. Montemayor believed in our youth, seeing them as the future of LULAC. In 1938, Montemayor began writing a series of essays in the LULAC News encouraging senior councils to organize and create junior councils and to include Latino youth. She believed that creating leadership amongst Latino youth was critical to the future success of LULAC. In addition, she believed that this form of civic engagement would provide youth with the opportunity to become “Good Americans” who would be “capable public servants, skillful debaters, knowledgeable citizens, and literate, independent thinkers.” Montemayor engaged and inspired the youth and eventually her dream became a reality with the creation of LULAC junior councils. As the second General Vice President, Montemayor advocated for the national political mobilization of women and promoted the establishment of more Ladies LULAC councils. Montemayor aimed to include women and children in a male dominated world. She stressed independent thinking, writing once that, “having the ability to think for one and forming an opinion of your own is necessary in our organization.” Montemayor used the power of the pen to send her message throughout the organization and wrote numerous essays for the LULAC News addressing the need for more Ladies LULAC. She understood that Latinas needed political empowerment and that LULAC would benefit from the inclusion of women. Today’s Latinas are facing similar issues in the fight for gender equality, the largest being representation in media, higher education institutions, and politics. In order to address these issues, we must look back at the successes of our predecessors, like Alice Dickerson Montemayor. It is our duty as Latino youth and young adults to seize Montemayor’s call to action and mobilize through grassroots efforts in order to engage our communities to influence the heart of America. The struggle towards gender equality is currently being addressed in the demand for fair political representation. In the last decade alone, Sonia Sotomayor became the first Latina U.S. Supreme Court justice in 2009, and Susana Martinez of New Mexico became the first Latina to serve as governor of any U.S. state. Also in 2010, Lucy Flores became one of the first Latina members of the Nevada Assembly. While we have these victories, we must not accept these as consolation prizes. We must continue to push forward for greater representation. Today, LULAC relies heavily on its youth and women members to carry forth this mission of empowerment; and as the fight continues, opportunities grow. Although many may not know her name, Montemayor's legacy and spirit resonates within us. To eliminate the inequalities our community faces, Latinas and youth must acknowledge our history and learn from past successors, so that we too can become poderosas. Justina Sotelo is a third year undergraduate student at UCLA, where she is pursuing a double major in Political Science and Chicana & Chicano Studies as well as a Minor in Education. Her passion for education reform led her to intern at the LULAC National Office in Washington, D.C. The Latino voter in the United States has long been described as a “sleeping giant,” a potential voting bloc with the power to sway the election. Ever since this realization, politicians on both sides of the aisle have attempted to persuade the Latino community that their platform is the one that benefits the Latino community. With such a large amount of votes at stake, it is not uncommon to see politicians attempting to appeal to the Latino demographic in political ads, articles, and interviews. Some of these efforts include–but are not limited to–speaking Spanish (badly), claiming to be an “abuela,” making appearances at Mexican restaurants, and of course, celebrating Cinco de Mayo. Unfortunately, their attempts only come off as a form of pandering, or as some have coined it, “hispandering.” Instead of connecting with the Latino voter, their pandering just highlights their lack of understanding of who the average Latino voter is, often ignoring the nuances within the community. However misguided their efforts may be to cater to Latinos, their outreach efforts make sense. It would be unwise to ignore such a large part of the electorate, and in this election, it’s projected that there are 27.3 million eligible Latino voters. This is a significant number, but up until now Latinos have largely been considered one monolithic group. Reducing them as such does not benefit anyone and has the capability of taking away the responsibility of candidates to understand the complexity of the community. 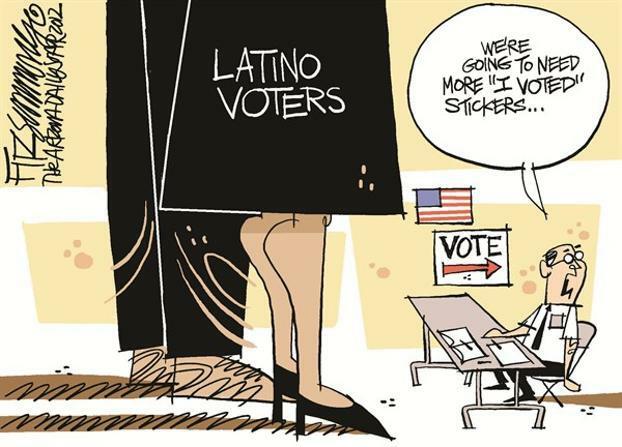 One crucial characteristic of the Latino vote is the composition of who is voting. Forty four percent, almost half, of the Latino electorate are millennials. This is at a much higher percentage than any race or ethnicity. Similar to Latinos, It has also been clear that candidates have been vying for the millennial voter, and it seems that the Latino voter and the millennial voter may not be that different from one another. It's important to note that millennials and Latinos alike prefer to talk about the issues rather than a candidate. They care about the issues that affect their friends, families, and neighborhoods. Yet, if we look at the way media, politicians, and the general public portrays Latinos, you would think that the only thing Latinos care about is immigration reform. This is simply not true. Like any other demographic in America, Latinos are deeply concerned with other issues. In fact, when determining their presidential candidate, 33% of Latino chose “jobs and the economy” as the top issue to consider. Only 17% believed immigration was the most important issue. Education and healthcare were also two other major issues. Of course immigration is still important to Latinos, as the immigrant and Latino experience, at some level, are tied to one another. However, the problem of simply focusing in on this one issue is that it polarizes immigration to be, almost exclusively, a Latino issue. It is time that politicians recognize that Latinos are not single-issue voters. We are diverse in the problems we care about just as we are diverse in our cultures, backgrounds, and stories. Stephanie Vela is the Education and Youth Programs Intern at the LULAC National Office in Washington, D.C. She is a senior at American University and is majoring in Sociology with a minor in Education and will be graduating in the Spring of 2016.